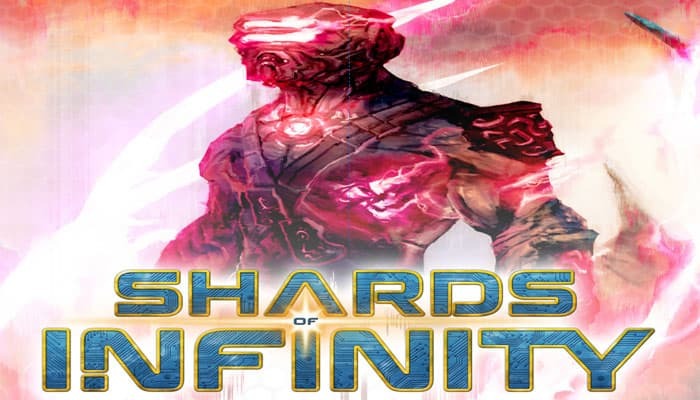 In Shards of Infinity, players compete to gain mastery of the Infinity Shard, a small fragment of a weapon of unlimited power. You must either be the first to master this powerful artifact, or you must destroy anyone else who has one before it is too late. Each turn, you will play cards to gain resources. Gems allow you to recruit Allies and Champions. Use Power to attack enemy Champions and players. Mastery lets you unlock new abilities from your cards, leading to ultimate control of the Infinity Shard. The last player with Health remaining wins the game. 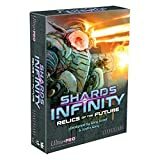 Shards of Infinity can be played with 2-4 players. Randomly determine which player goes first. From there, play proceeds in a clockwise direction. Each player has a character card to track their Health and Mastery. Each player begins the game with 50 health. Players begin the game with different amounts of - the player going first starts with 0 , while each other player gets 1 more than the previous player. Example: If there are 4 players, the player going first starts with 0 , second gets 1 , third gets 2 , and the last player gets 3. 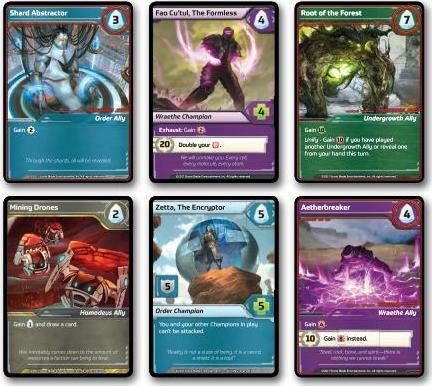 Each player has a starting deck consisting of seven Crystals, one Shard Reactor, one Blaster, and one Infinity Shard. Players shuffle their own starting deck and then draw five cards (leaving five cards remaining in their deck). Shuffle all black-bordered cards face down to form the center deck. From the center deck, flip six cards face up in a row between all players. This forms the center row. Place the center deck on one side of the center row. To play a card from your hand, place it face up in front of you in your Play Zone. Cards in the Play Zone don't go to your discard pile until the end of your turn. At any time, if your personal deck is empty and you need to draw a card or reveal a card from the top of your deck, shuffle all cards in your discard pile to replenish your deck. If you need to draw multiple cards and your deck runs out in the middle of the draw, shuffle the discard pile to replenish the deck and draw any required cards. Cards you recruit during your turn are placed into your discard pile. Whenever a card leaves the center row, replace it immediately from the center deck. This happens before anything else occurs. At the end of each turn, discard any cards left in your hand. Then draw 5 new cards for your next turn. Some cards may have text that contradict these rules. If card text ever contradicts the rules, follow the card text instead. Each turn is broken down into three phases. During the Play Phase, you may take the following actions in any order. Play cards from your hand to gain , , , as well as other effects. Exhaust Champions to gain their effects. Recruit any number of Allies, Champions, or Mercenaries by paying their cost. Once recruited, place them into your discard pile. Fast-play any number of Mercenaries by paying their cost and putting them into the Play Zone, gaining their effect immediately. Assign any remaining to attack your opponents. Damage does not have to be assigned evenly between opponents. After all damage is assigned, players who are attacked may reveal any number of cards with Shields from their hand to prevent damage equal to the number in the icon of the revealed cards. Reduce each player's by the total assigned to them, minus any shield reduction they used. Any players with 0 or less are out of the game. Put each fast-played Mercenary on the bottom of the center deck. Put each Ally from your Play Zone into your discard pile. Champions remain in play. Place all unplayed cards in your hand into your discard pile. Draw 5 cards from your personal deck. You now know all the rules of the game! If you are familiar with deckbuilding games, you can try playing now, or read on for more details. Character cards represent each player in the game. Character cards are used to track your and totals. Whenever you take damage, you reduce your dial that amount. If your dial gets to 0 , you lose. You cannot go above 50. Each Character Card has a Focus ability. To Focus, exhaust your character card (by turning it sideways) and pay 1 to gain 1 . Exhaust powers, including Focus, may only be used once per turn. Gaining can unlock special abilities on your cards (See Mastery Threshold Bonus below). If you get to 30 mastery, you are ready to unlock the ultimate power of the Infinity Shard. You cannot go above 30 . You can recruit Allies when they are in the center row by paying their cost and putting them into your discard pile. You can play any number of Ally cards from your hand each turn. When you play an Ally from your hand, gain the effect listed on the card. If an ally has multiple effects, perform them in the order listed. Allies stay in front of you in your Play Zone until the end of your turn, and then go to your discard pile. When you recruit an Ally, it becomes a part of your deck for the rest of the game, but you need to wait until you draw it to gain its effect. Sometimes, you need an effect immediately, and that is where Mercenaries come in. In addition to having the option to recruit a Mercenary just like other allies, you may fast-play a Mercenary instead. To fast-play a Mercenary while it is in the center row, pay its cost, gain its effect immediately and put it into the Play Zone. At the end of each turn, all fast-played Mercenaries move from the Play Zone to the bottom of the center deck (NOT your personal deck). You may only fast-play a Mercenary once and you may not recruit a Mercenary after it is fast-played. Mercenary Allies that are fast-played count as an Ally played that turn. This means that fast-play Mercenaries can help you meet requirements for Unify and Dominion effects. Champions are recruited just like Allies and go to your discard pile once recruited. 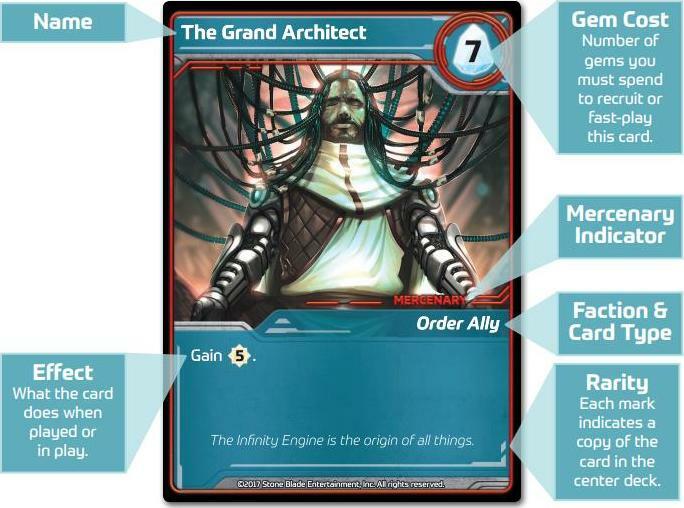 Unlike Allies, once a Champion has been played it stays in your Play Zone from turn to turn. 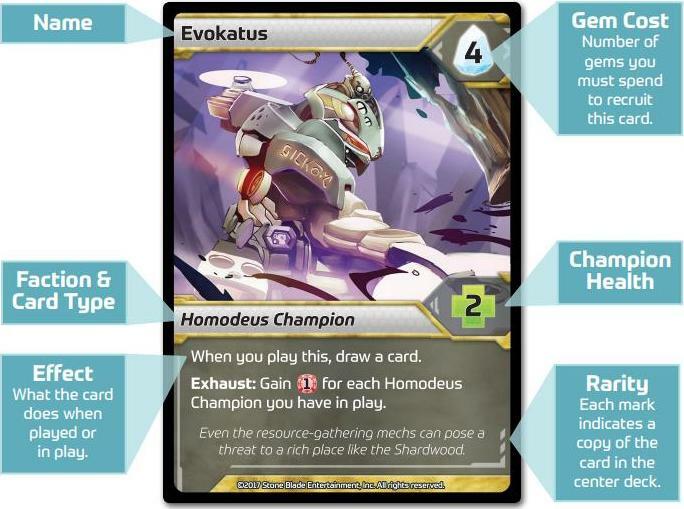 Champions go to the discard pile only when they've been dealt damage equal to their or destroyed by a card's effect. You can play any number of Champion cards from your hand each turn. After you play a Champion from your hand, you may exhaust it to use its effect any time during your turn. To exhaust a champion, turn it sideways to indicate it has been used, then follow the instructions after the word exhaust. Each champion may only be exhausted once per turn. At the end of your turn, reset all Champions you control so they are ready to be used again on your next turn. To attack a Champion, use the gained during your turn and deal damage to it as though it were a player. In order for a Champion to be destroyed, a player must deal damage equal to the Champion's in a single turn (Champions do not track damage from turn to turn). When a Champion is destroyed, it is put into its controller's discard pile. It may be drawn and played again on a future turn. Playing a card means to take it from your hand and put it in front of you in your Play Zone. When playing an Ally card, announce its effect, and follow the instructions on the card in order from top to bottom. Any choices required by the card must be made at that time and any conditionals must already be met for additional effects to be gained. 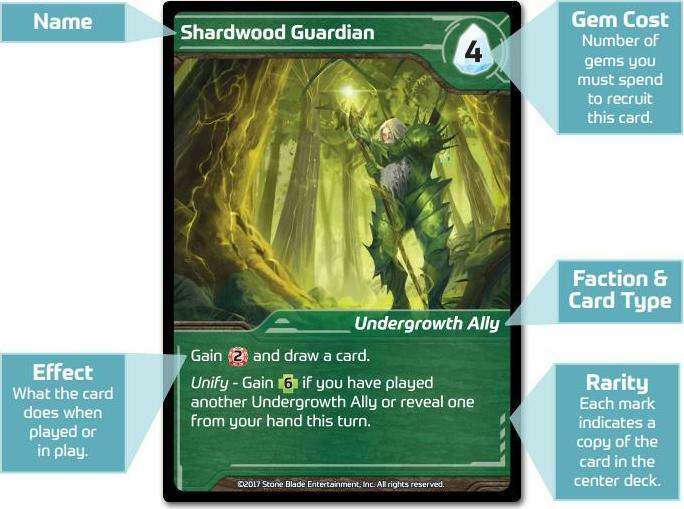 or generated can be used until the end of your turn. You do not have to pay any costs to play Allies from your hand. Example: Reactor Drone says, "Gain 3 gems ". When you play Reactor Drone, you gain the 3 gems immediately, but you can wait until later in the turn to decide how to spend your gem. Champions are played just like Allies, except Champions remain in the Play Zone and can be exhausted on each of your turns. Every effect written after exhaust and below it will occur once a Champion is exhausted. Gaining is a way to make your cards more powerful. Once during your turn, you may spend 1 to gain 1 . This is called your Character Focus ability. Your mastery total is tracked on the bottom right of your Character Card. Card effects may grant additional in a turn. You can have a maximum of 30.
is not spent to gain card bonuses. When you gain mastery, it is gained permanently for the rest of the game. Some cards have a Mastery Threshold Bonus. When playing a card with a Mastery Threshold Bonus, you are granted the bonus ability when you play the card if you have at least the amount of listed on the card. You do not need to spend in order to gain a Mastery Threshold Bonus. Example: If you play Infinity Shard while you have 10 mastery , you gain 3 power instead of 2 power. If you have 20 mastery, you will gain 5 power , and if you have 30 mastery , then you will gain Infinite . Cards only check for a Mastery Threshold Bonus at the time they are played or exhausted. gained later in the turn will not impact them. If a card played gains mastery and has a Mastery Threshold Bonus, the the card provides will count towards the Mastery Threshold Bonus. Example: if you have 9 mastery and play Fungal Hermit, you would gain 1 master, making your total 10 mastery. This would make it so you get the Mastery Threshold Bonus from Fungal Hermit, and you would gain 5 . During your turn, cards you play may produce Power . is used to attack Champions and players. To attack a Champion, use enough to equal the Champion's total. When you destroy a Champion, put it into its controllers discard pile. You may attack Champions at any time during your turn. Be sure to remember that damage dealt to Champions does not carry from turn to turn, so only attack a Champion if you have enough to destroy it that turn. To attack a player, use your remaining power at the end of the turn. Though Champions can be attacked at any time, all damage to enemy players must be done at once at the end of your turn. You may divide your among your opponents any way you choose. Cards with Shields are used to prevent damage to you. These cards will have a on the left side of the card. To use a card's , reveal it from your hand when you would be dealt damage to reduce the amount of damage taken. 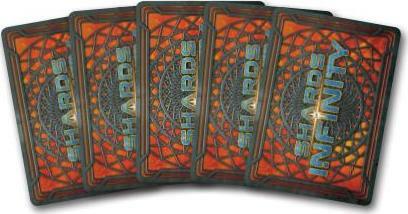 You may reveal any number of cards with from your hand to prevent damage. Example: John is attacking Sarah for 7 Damage. Sarah has Command Seer in her hand. 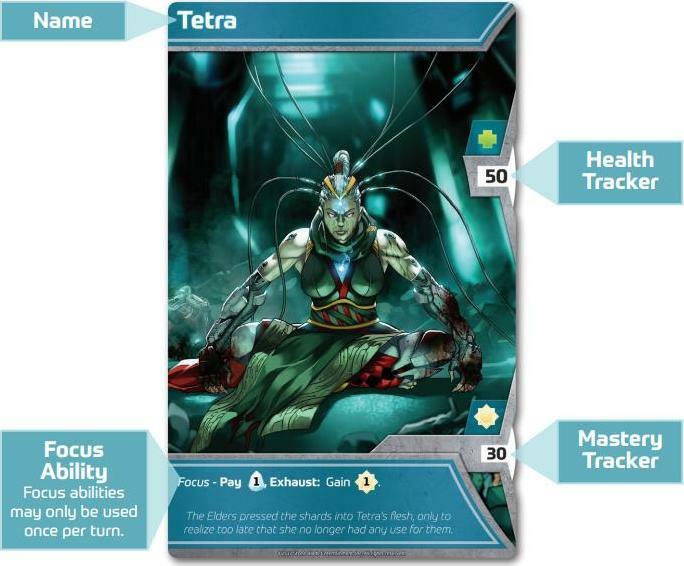 Since Command Seer has 5 shield , she reveals it and only takes 2 damage, reducing her damage wheel from 50 to 48. 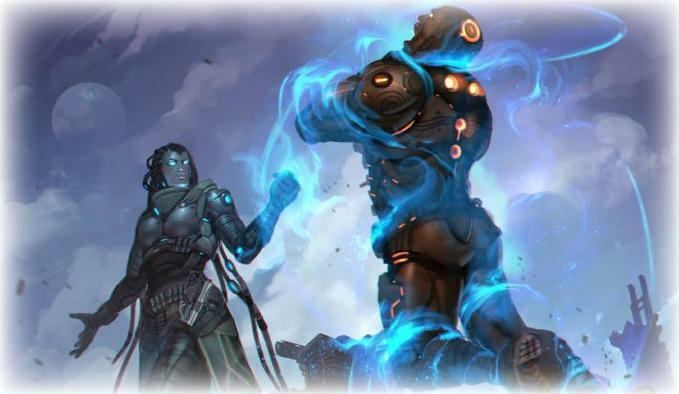 Cards with are not discarded when used to prevent damage during an opponent's turn, but remain in your hand and can thus be used as a in a future turn and/or played as normal during your turn. A shield may NOT be used to prevent damage to your Champions. Some cards allow you to gain . Once is gained, increase your on your Character Card by the amount stated. Player cannot go above 50 health. When a card tells you to banish a card from your hand and/or your discard pile, you may put a card from that zone into your banished pile. Cards in your banished pile are no longer in your deck and are removed from the game. If a card allows you to banish a card from your hand, you may not banish a card that you've already played that turn, as that card is no longer in your hand. Banishing your weaker cards, especially some of your starting cards, allows you to draw powerful cards more often. After you are done playing cards from your hand, recruiting/fast-playing Allies and recruiting Champions, place any remaining cards from your hand and any Allies in your Played Zone into your discard pile. Any unspent and disappear and do not carry over to your next turn. Draw five cards to replenish your hand. When you end your turn, play passes clockwise around the table. A player is eliminated when their is reduced to 0. When only one player remains, that player is declared the winner!